Special Attack: Destructive Grenade; A missile-type attack that follows the enemy until exploding on contact. Guardromon's main objective is to attack intruders. His armored body is made of iron. 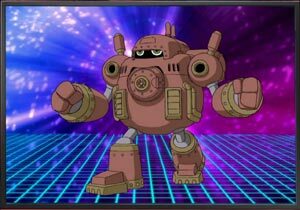 In Xros Wars, a large group of Guardromon serve DarkKnightmon in the Dust Zone saga. They are eventually defeated by the Kiriha and Taiki team of digimon...with Taiki's using Shoutmon X5.